Eleven years ago today gamers first got a chance to play the greatest video game ever conceived. I speak of course of The Legend of Zelda: Ocarina of Time. 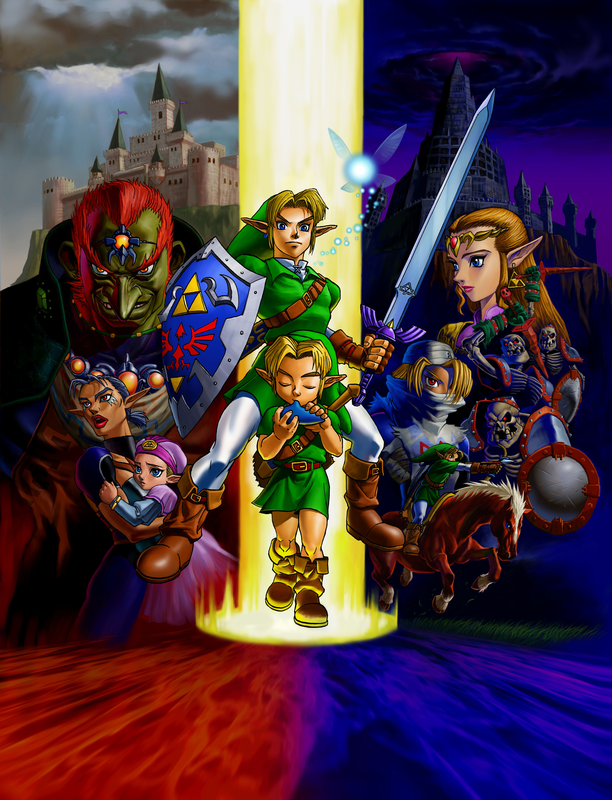 Now, I have already written extensively about this game in an earlier post, but in a new section here at Norwegian Morning Wood, I'm willing to make the claim that OoT is the Undisputed greatest video game of all time (of course calling it Undisputed I'm sure is disputable. Figure that one out). To truly raise this game to a level beyond all others necessitates not only entertaining gameplay, but an indelible influence within the industry, an extensive and invigorating story as well as superb graphics and game control. OoT has all this in spades. I have played through the entire game start to finish twice now, but only recently did I complete every aspect of a game. That is, every heart piece, every Gold Skulltula, every Big Poe. It's an arduous task that I'll admit I used a few guides to complete. It's the little things like this that help the appeal though. The game world is so incredibly expansive and yet there's a function for almost every square inch, whether there be a hidden Poe, heart or even just a nice twenty rupees. Dozens of tiny side missions, little hidden alcoves and tons of nooks and crannies to explore make this game still fun and explorable after eleven years, which is certainly a big part of my recent interest. As my recent posts on Conker's Bad Fur Day should attest to, I have had a big interest in the Nintendo 64 console in general for the past few months (years). The console has an undefinable appeal to me as one of the best gaming systems. Its graphical and memory capacity allowed it to have a bigger story than most SNES or Genesis games, while its limitations I believe allows it a degree of humility and classicness. There's something about the hard-hitting, defined and limited 12-player roster of Super Smash Bros for instance, that makes it much more personally appealing than the sprawling, shiny and fluid Super Smash Bros Brawl. I probably know a few million gamers that would heavily disagree with me, but aesthetically I love the complex stories driven by the simple weirdness of the N64. That said, OoT pushed the boundaries of the system far to its limits. Starting with an unprecedented 256-bit cartridge, the amount of gameplay as well as story within OoT is astounding. There's a total of twelve dungeons amidst thirteen map locales with forty-eight equipable items and weapons. The puzzles are complex, maps massive with scant draw distance and fog. Every gameplay element in addition to the physical scope is near-perfect. The controls are highly customizable, the easily adjustable camera (besides fixed camera scenarios, which never come awkwardly), including the lock-on targeting is incredibly innovative (much unlike Conker), and the context-sensitive button allows for a wide range of actions with a disciplined control hardly found in any other game. There's really so much more to this game. The epic scope and breath of action alone pits it on a higher playing field. Across time, days and years you really see how the entire land and people change. This was one of the first games to have an internal clock and open air environment, practically the standard today. There is also an epic feel to the story. Link's moniker, the "Hero of Time" stands true throughout the cheery childhood levels and then beyond to the bleak adult years. There is a mastery of mood and tone that arcs across the entire story, culminating in one of the best final boss fights of all time. The stakes are tremendous, set-up compeltely archetypal, the whole atmosphere is perfect. Even the official player's guide reads like an epic novel, narrating Link's adventure as if it were a ye olde tale rather than a sophisticated virtual experience. Every part of this game and mythos is loaded with a sense of pride and class that puts it on a pedastal above and beyond any other gaming experience, from the dramatic score to the endless amount of treasures and mysterious achievements to unlock. Simple things like killing Stalchilds in Hyrule Field at night until a giant one emerges to fight. No real purpose in the game other than a cool secret. Everything about this game is awesome and still entertains me today. There is so much to this game, which gets nearly everything perfect. I have also failed to mention so far the slightly twisted sense of humour that pervades the game (see killer Cuccos, mask-wearing guards and plenty of other silliness) which balances some of the dire stakes always in the background. So basically to sum up, I love every bit of this game, it's been a great eleven years and I dare you to name a better all-around gaming experience. Nay...a better life experience. Awesome.